the company based in Ogden extended its rim range: the clincher rims are on the market since a few weeks, and the first flat section rims are being delivered. result is much more interesting. 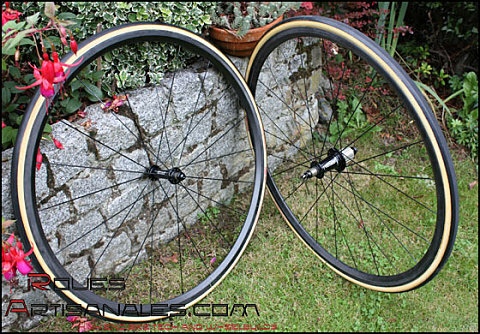 These 1.24 rims only weight 215g for a depth of 24mm and a width of 21mm, in a triangular section. paint them or anything that would add weight. » The rims have an unidirectionnal carbon finish, which reminds the newest generation Shimano rims. The serie number 2 of the Edge rims is differently finished and is stiffer. It is composed of 3K carbon fibre and a clear coat is applied in surface to make it visually perfect. On the other side, the rims of the serie number 2 are 50g heavier. The Edge range is now composed of three models: 24mm, 38mm, 68mm. The two last are coming in 1 and 2 version, and in clincher version too. exceptional, but considering the extremely low weight of the components, it is much more exciting. The spoking is radial front and rear non drive side, it helps saving weight, and increasing the lateral stiffness. to flex and resist to the impacts. 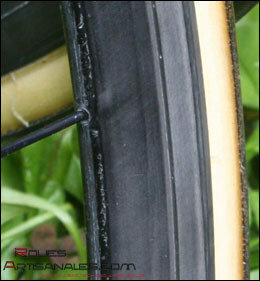 Finally, a flat rim needs longer, flexier spokes, so the wheel is also flexier where the lateral load is applied. But the rim also moves less between the brake pads. important. Velonews published an article some months ago about the two american manufacturers. Lew Racing accused Edge of copying a part of the manufacturing process: read the article. The pursuits do not seem topical anymore but they reveal the technology the Edge rims beneficiate. Well these 1.24 rims are under test. If the perform well, we will add them to the boutique.